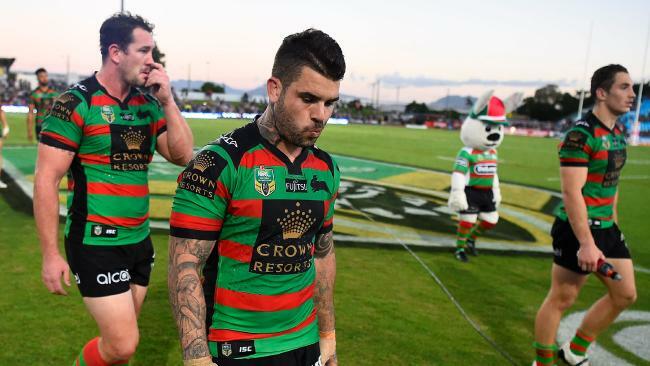 SOUTH Sydney Rabbitohs have revealed playmaker Adam Reynolds has suffered a foot injury at pre-season training. The NRL club said the former NSW No. 7 had been placed in a moon boot as a precaution. "He's got plantar fasciitis, which is essentially inflammation of the sole of his foot," Rabbitohs head of performance Paul Devlin told the South Sydney website. "We've put him in a boot to offload it and allow the inflammation to settle." Devlin was confident Reynolds would soon resume running again on the training paddock. "It's very common," he said. "When you get anything which concerns your foot, the easiest way is to put it in a boot which compresses it, takes away the pressure from his foot and allows it to heal quicker. "He'll start running again really soon." Reynolds was starting to hit top gear at pre-season training after revealing last week he had played the last six rounds of the 2017 season in pain and had undergone off-season surgery to remove a floating bone in his ankle. The Rabbitohs have pre-season trial games against English club Wigan on February 17 in Sydney and a February 24 clash with St George Illawarra at Mudgee.